Photo: Courtesy of the Embassy of Ukraine in Germany. 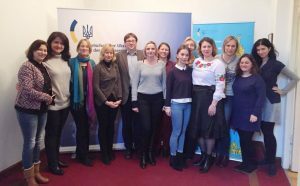 From 17 to 18 November 2017, 28 participants from 20 institutions in Germany, Switzerland and Austria met in the Embassy of Ukraine in Berlin to discuss current issues in the field of practical teaching of Ukrainian as a foreign or heritage language. The focus was on methodology and didactics of teaching Ukrainian both to children and to adult learners, as well as the increasing the opportunities for improving knowledge of Ukrainian language in German-speaking countries. This workshop aimed to bring together the key actors from Saturday/Sunday schools, secondary schools and universities and to make recommendations to the Government of Ukraine to improve the framework of teaching Ukrainian language abroad. This workshop was organized by the Institute of Slavic Studies of the University of Greifswald (which has the only chair in Germany dedicated to Ukrainian language and Ukrainian studies) in cooperation with the German-Ukrainian Academic Society and the German Association of Ukrainists on the occasion of the Year of the Ukrainian Language in Germany 2017-2018.